Episcopal ordination of Bishop Paul Yu Pin (Yu Bin 于斌) in cathedral of Beijing (Beitang). 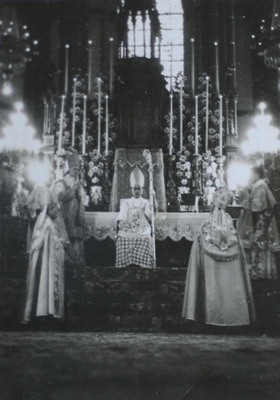 ; Yu Pin is the one seating with the altar behind him. Episcopal ordination of Bishop Paul Yu Pin. September 20, 1936. Société des Auxiliaires des Missions (SAM) China Photograph Collection, Whitworth University Library, Spokane.